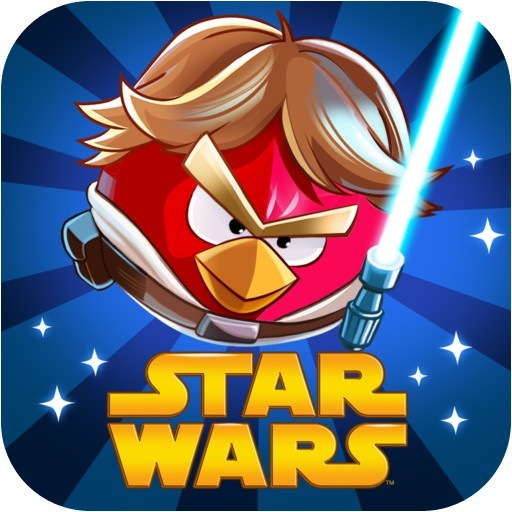 I’ve got to admit, when I first heard that Rovio was set to release a Star Wars themed Angry Birds game, I thought it was a joke. After I realized that it was real, I started wondering how the mobile giant would treat this venerable series that has, admittedly, had its ups and downs over the years. It turns out Rovio has managed to accomplish the impossible: make a Star Wars game in this day and age that’s actually fun to play. Angry Birds Star Wars (Free) is an excellent addition to the series with just enough fan service and formula tweaks to make it a must-play. 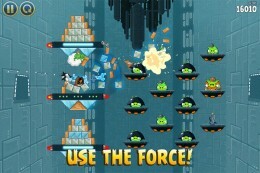 Folks even vaguely familiar with any previous titles in the Angry Birds series will have no problem with Star Wars. The same premise of flinging birds in a slingshot into Empire-dressed pigs applies and is as enjoyable as ever. In addition, Angry Birds Star Wars splits its levels between the traditional worlds found in most titles, and the gravitational fields-based worlds of Angry Birds Space (Free) It’s a nice mix of levels and a great example of how far Rovio has come with level design. 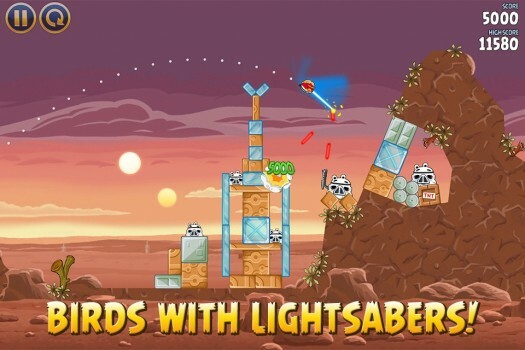 As was the case with Space, Angry Birds Star Wars makes some significant changes both visually and functionally to the cast of birds. For example, red bird now boasts a lightsaber that can deflect blaster bolts and destroy buildings while black bird (in a Jedi robe) now uses a force push that can send blocks flying if used correctly. Yellow bird now wields a blaster and can fire shots at single location on the screen and fat bird is now simply Chewbaccabird and causes havoc wherever he lands. Even the eagle gets a makeover as the Millennium Falcon (Get it?!). There are far more changes to the birds in Star Wars than any other previous title which goes a long way towards making it stand out. The birds aren’t the only cast of characters to get a makeover, as the pigs have some new tricks up their sleeves as well. 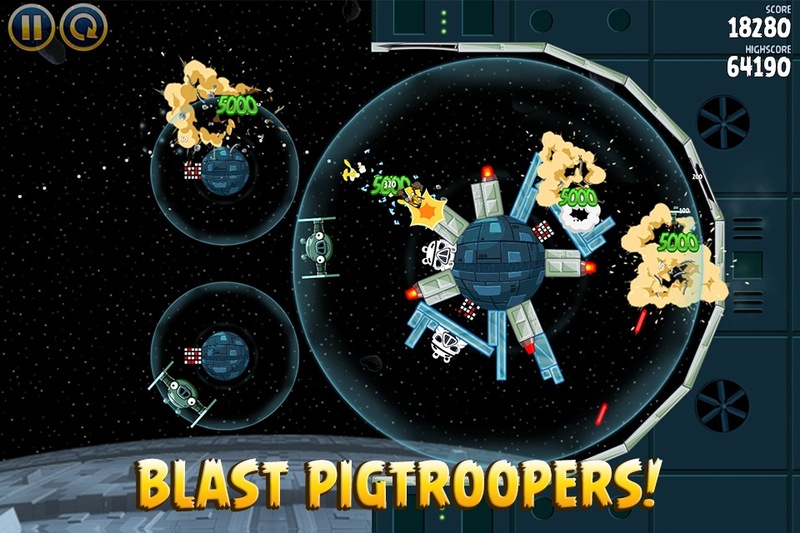 Some pigs will boast blasters that will perpetually shoot bolts until destroyed, while sith pigs can keep blocks and other pigs in suspended animation until taken out (which usually leads to a massive scene of destruction as everything comes falling down). 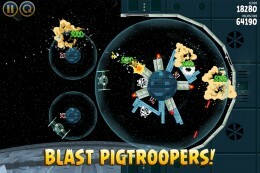 Tie fighter pigs also inhabit the skies above plantetoids in space missions and require more than a simple hit to take out. There’s a lot of new elements to pay attention to in Angry Birds Star Wars and it all works flawlessly. A lot of that excellent execution is due to the amazing level design found in Star Wars. Rovio has managed to create a lot of levels that not only require mastery of basic bird flinging, but also with the nuanced aspects of the new special features for each bird. For example, you’ll encounter levels that highly encourage you to use red bird’s lightsaber to deflect bolts at the opposition. Another level might have you use yellow bird’s blaster to ricochet bolts off of bricks in order to hit a target surrounded by blocks while others might charge you to use black bird’s force push in a precise fashion to fling blocks to start a chain reaction. Each one of these examples focus on Angry Bird Star War’s increased emphasis on precise timing, which is a bit of a different turn from the standard focus on aiming. While this may make the game harder than its predecessors, success also feels far more rewarding. Like other Angry Birds games, Star Wars comes with a wealth of levels to complete, with available missions loosely spanning Episode IV that take place on Tatooine and the Death Star (complete with Angry Birds-themed cutscenes). In addition, a third set of missions on Dagobah are available as IAP and feature some incredibly tough levels. Star Wars also continues the theme of bonus missions for finding hidden eggs and accumulating enough stars. These missions have you utilizing R2-D2 and C-3PO birds, which have their own abilities (and really shouldn’t be restricted to bonus levels). Rovio also seems committed to a wealth of free content updates as the game currently advertises a future Hoth update as free when it arrives. When you have a series as large and as successful as Angry Birds, it can be a challenge to to keep new titles fresh and exciting while still maintaining that careful balance of fun and accessibility that made it so popular in the first place. 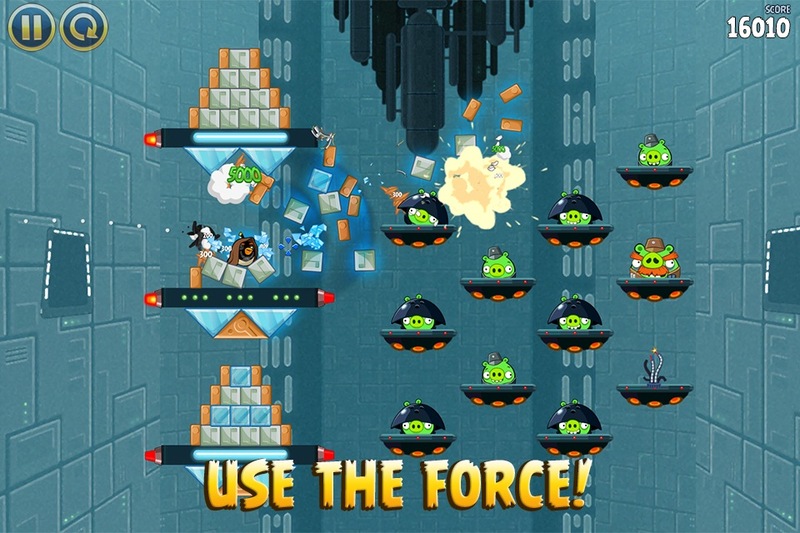 With Angry Birds Star Wars, Rovio continues its track record of iterative changes to the core formula while still keeping everything we love about the series. With the added heft of Star Wars fan service, it’s not hard to see why Angry Birds Star Wars is an excellent game. It’s my favorite game in the series, and is well worth the status of ‘must-play’ for any iOS gamer.